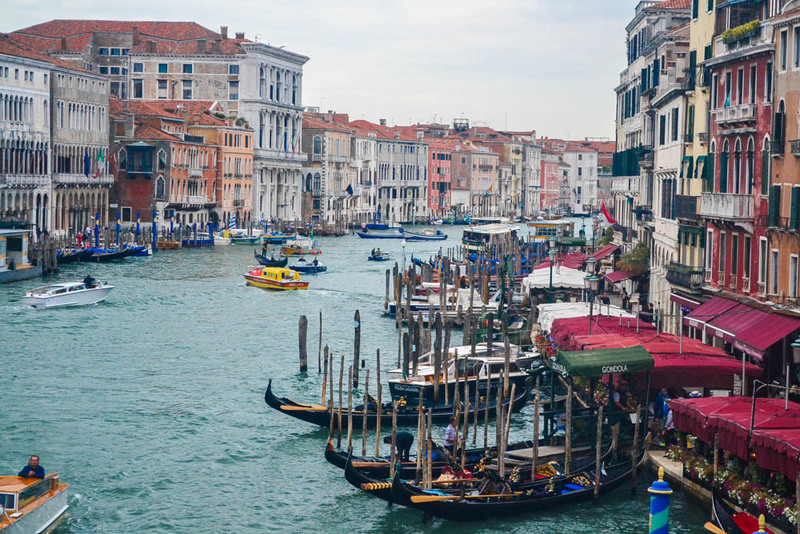 Venice, the city of canals, romantic gondola rides and ballad singing gondoliers, James Bond movie sequences and a playground for the rich and famous is one of the most popular tourist destinations in Europe. 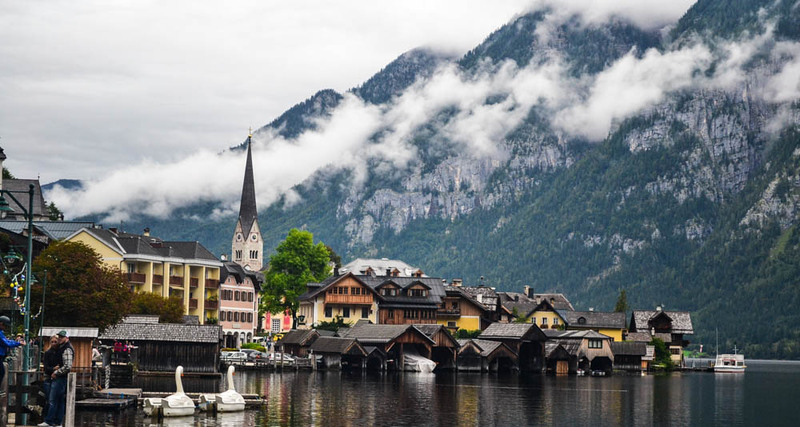 Prestigious events from the art, architecture, music and film fraternity, like the Venice Biennale (a part of which, is the Venice Film festival that awards the ‘Golden Lion’ – we’ll revisit this later) are conducted here. No wonder then, that this is a place where the rich and famous often hobnob. The seducer Casanova had Venice as his playground. Ernest Hemingway was fond of the place, so was Henry James, Charlie Chaplin, and a whole horde of A-listers from the illustrious art fraternity. So if we only have a day to spare, where do we begin with, in a place as “magical” as our receptionist put it, in Venice ? History is always a good place to start. 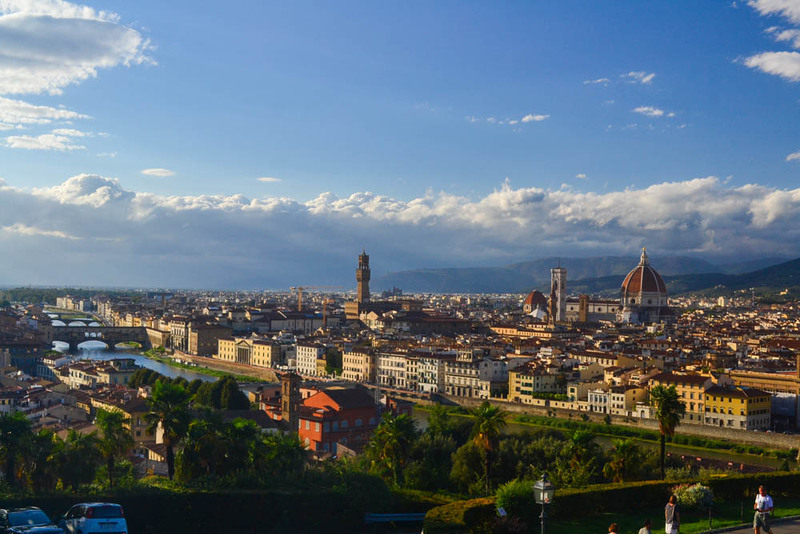 We learn on our tours of Rome and Florence, that Venice was first inhabited by citizens from the nearby cities of Padua and from the empire of Rome, almost all of who were fleeing the barbarian invasions of their now declining states. Over the next millennium, with it’s strategic position on the Adriatic coast, it developed into a flourishing maritime republic, with trading outposts across the Adriatic and Dalmatian coasts that allowed it to establish trade with Western Europe, Constantinople and Central Asia. Merchants made a killing and the grand structures that still line the canal, embody the riches that they brought to Venice’s shores. Owing to this rich fraternizing and patronization of the trading community, Venice grew into one of the most prosperous cities in Europe from the 11th – 15th century, a place of great wealth and ostentation, a reputation that it still enjoys to this day. Then, is it possible to visit Venice on a budget ? Absolutely. If you do not fit the criteria for some of the famous names mentioned above, it is still possible to fit in a sightseeing trip to Venice for a day or two. Any more and you’d be stretching your budget a bit because this is a city and an island, a sinking one, built on pylons erected into the sea waters of the Adriatic. Therefore, everything from water to wine, brought from outside, has to be expensive, just as in similar tourist destinations like the Maldives. Some guides would point you to Mestre, but that robs some of the glamour and glitz of the Venetian experience. As this listing puts it, monasteries are a great place to stay on a tight budget in Venice. We find Cannaregio to have some good deals on stays. There are affordable options near the Venezia St Lucia railway station and our place, the Il Mercante De Venezia provides a clean, reasonably big room by Venetian standards. Most importantly, it is an affordable place to crash just a few minutes by walk. 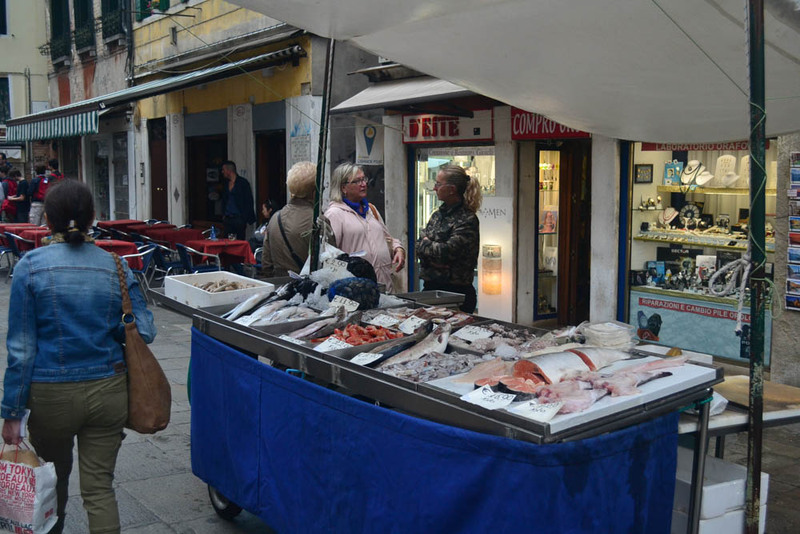 Even otherwise, Venice is an easy place to explore on foot. Even on a budget, there is a way to do something out of the ordinary – stay in a yacht docked on the canal. Here are some links to get you started, and some of them are quite affordable. We land in Venice post noon and a quick siesta later, are up to tour Venice by dusk. The usually crowded terminal 1, doesn’t look crowded any more. There is only 1 gentleman ahead of us in the booking queue and the operator hands us our vaporetto ticket quickly, before shutting down his counter. Gingerly, we move on to the vaporetto, the Venetian equivalent of the public bus, which is not as crowded as the ones that are returning back, and off we go. We have the free Rick Steve’s audio guide to Venice, that accompanies the vaporetto stop by stop, pointing out esoteric information about banks, famous casinos, playgrounds of celebrities, museums, churches and bridges on the way to San Marco. At dusk, Venice really puts on a beautiful light show as restaurants, cafes, markets and street vendors, all start lighting up. On the vaporetto, we can smell the sea all right, on the waters of the canal, but there is no stink as a lot of guides mention. The waters are deep green and opaque, hiding many secrets beneath. We have ignored the pricey 120 euro Gondola ride, that most tourists tell us, are hyped. The vaporetto departs from outside the Venezia Santa Lucia and for a sum of 7.5 euros, we watch the waters of the canal speed by as we move towards St Mark’s square or, San Marco. Another option available is the traghetto, which moves at a more leisurely pace, but could also require one to take the sights standing up. En route to San Marco, we see the geto, for the Jewish population that used to reside near the copper foundry, that resulted in the term ‘ghetto’. We also crane our necks to sight the Rialto bridge, albeit unsuccessfully. We catch a great view of the beautiful architecture of the eponymous Peggy Guggenheim museum started by the art connoisseur who hobnobbed with every famous artiste of her time – Brando, Capote, Lennon and Yoko Ono to name a few. We also pass by the Harry’s Bar, birthplace of the Bellini cocktail and the favorite of esteemed patrons like Sir Ernest Hemingway, who used to reside in the luxurious Gritti Palace hotel nearby. 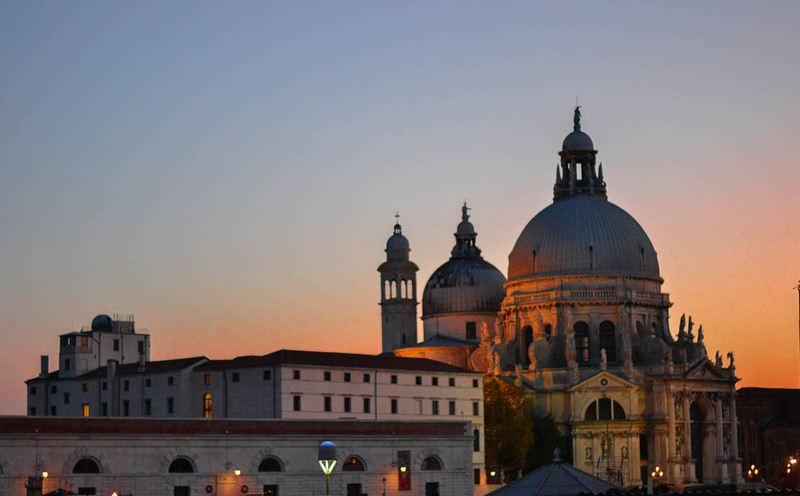 Evening colors paint the white dome of the La Salute, a church built to thank Saint Mary of Good Health (Santa Maria della Salute), apparently for saving Venetians from the plague of 1630. Mark Twain’s description wasn’t far off. 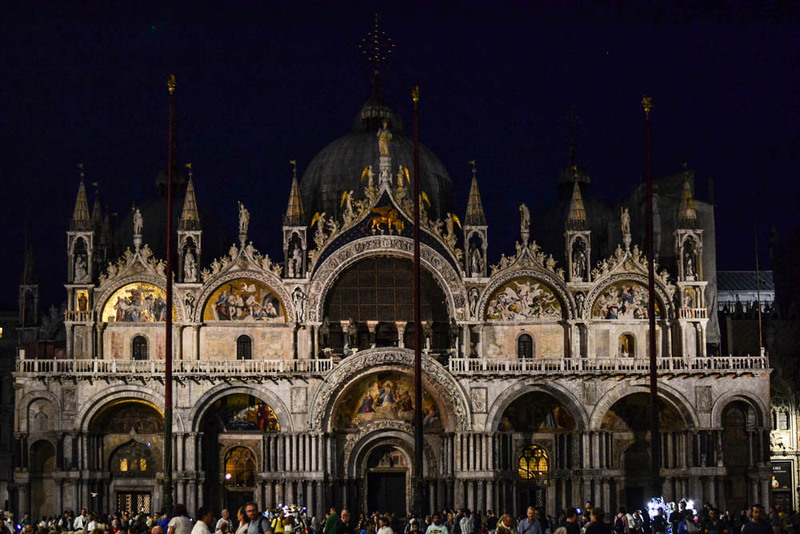 At night, the St Mark’s Basilica looks fit to star within a fairy tale and is far less crowded too. If you observe closely, the golden lion at the steeple formed by the onion shaped dome at the center of the Basilica’s facade, is the same as the one handed over to the winners of the best film, at the Venice film festival. 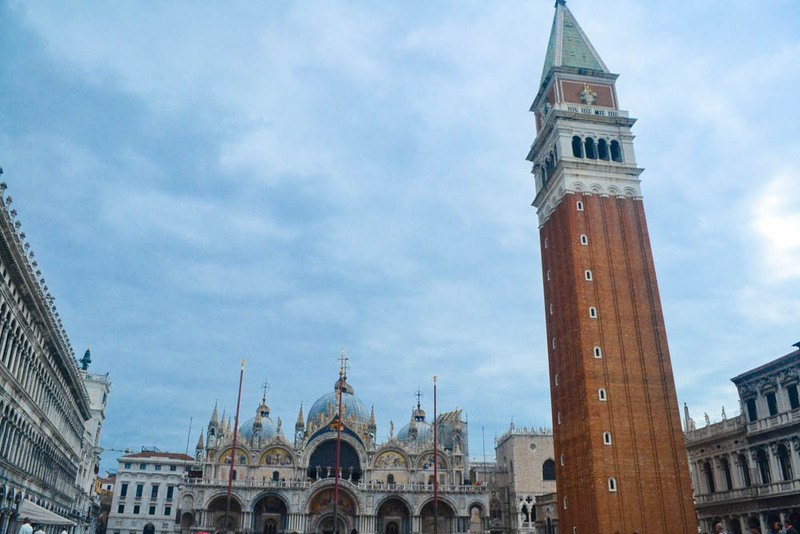 The 300 feet tall Campanile (or church bell) towers over one of the most famous squares in Europe, the Piazza San Marco. Behind it, is the St Mark’s Basilica and to it’s right, the pale Doge’s Palace. To the left and right, we can see the erstwhile government offices that governed Venice’s trading outposts. In 1902, this bell tower apparently cracked and the green top came crashing down, necessitating a rebuild of the entire tower, a beautiful replica of the original. Even now, corrosive floodwaters threaten to gnaw at the foundations of these architectural masterpieces. There is a cool breeze flowing in September, which is more comforting than chilling. The cafes and open-air restaurants at the square, air beautiful renditions of popular pieces of music through their own orchestras. We can immediately point out the theme from the movie Titanic, the end of which has the sparse crowd breaking out into an applause. Another cafe farther ahead in the square, has it’s own orchestra rendering an even more beautiful work by Beethoven, almost as if in a duel to attract more crowds. We move on. Looking out across the canal and bobbing gondolas to the white church of San Giorgio Maggiore and it’s strikingly resemblance to the San Marco Campanile (bell tower). 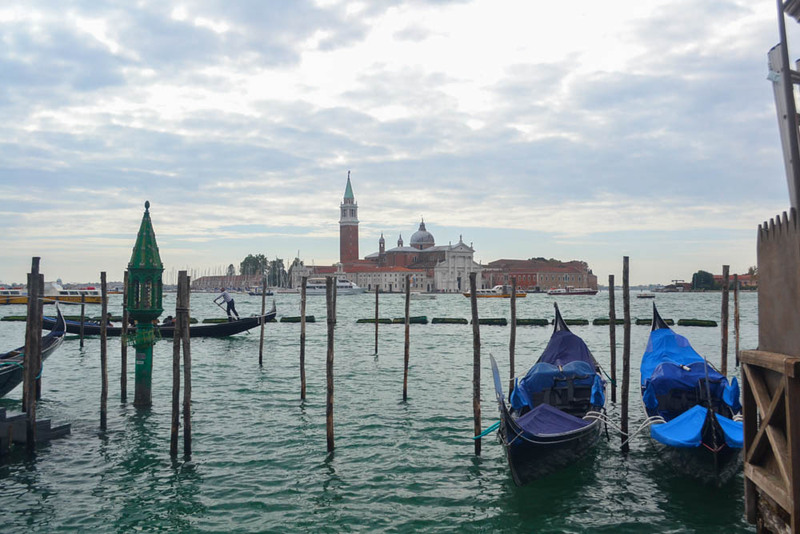 Turns out, that the vaporetto also gets there, only if we do not wish to disembark at San Marco. 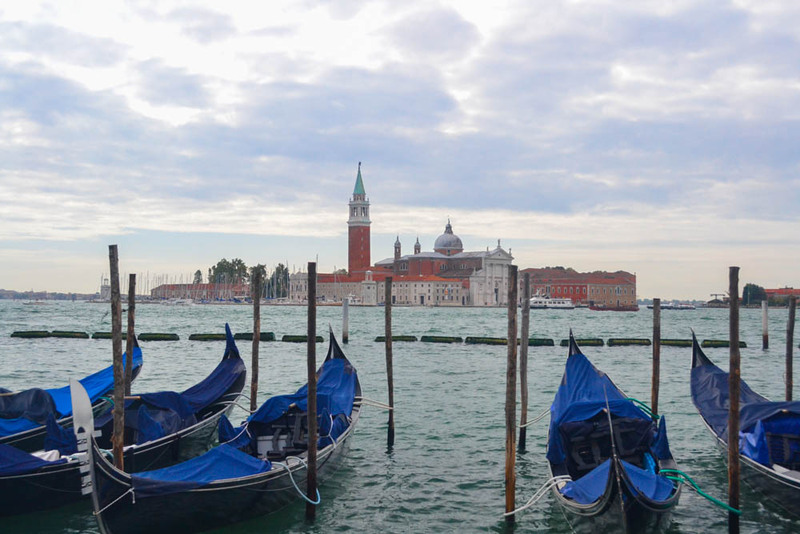 The view from that bell tower overlooking San Marco and the grand canal is priceless ! Tiny piece of trivia for Hollywood fans, the hotel Ciprani, situated on the island of Giudecca, to the right of the church, served as the venue for George Clooney’s wedding. The next day, as dawn strikes, we see a cloudy sky but it is warm and I should add, a little humid as well. We end up gobbling a saccharine sweet Italian breakfast, downed with some cappuccino. Here, the prices advertised are only for a 100 gm of each item, and since we don’t read the fine print thoroughly, end up paying for our carelessness with a sizable 14 euros for breakfast. A better option for us would have been breakfast from the hotel where we were staying. We decide to walk now, towards San Marco, a good complement to the water way that we’ve taken last evening. After all, getting lost in the narrow alleyways of Venice is also an experience that should not be missed. Another good option would be to take a boat ride to the islands of Murano-Burano that most tourists do. But we decide against it, since there is just so much to see in Venice itself, for a day. 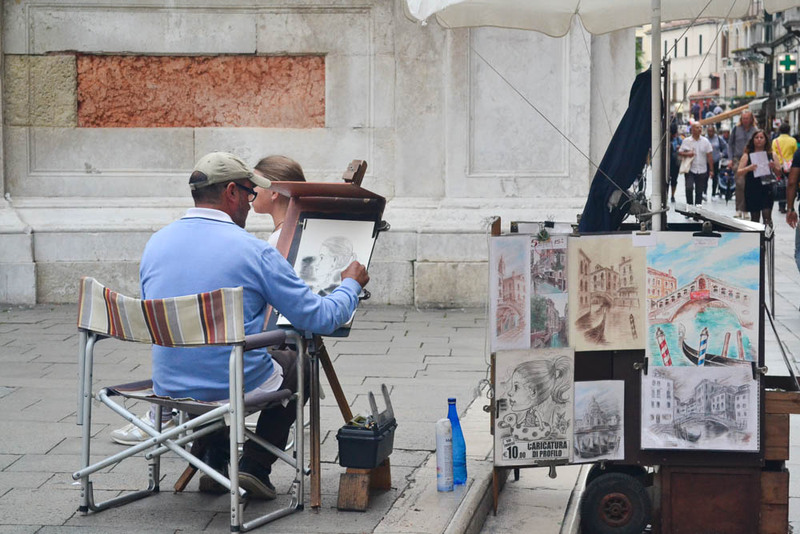 Hand drawn sketch and paintings, fresh off the streets of Venice, Florence and Rome are a great deal for a lot of tourists. These artists, sitting in one of the squares, also provide a great idea to just indulge in people watching. Gondolas are expensive if you haven’t got the willingness to splurge. 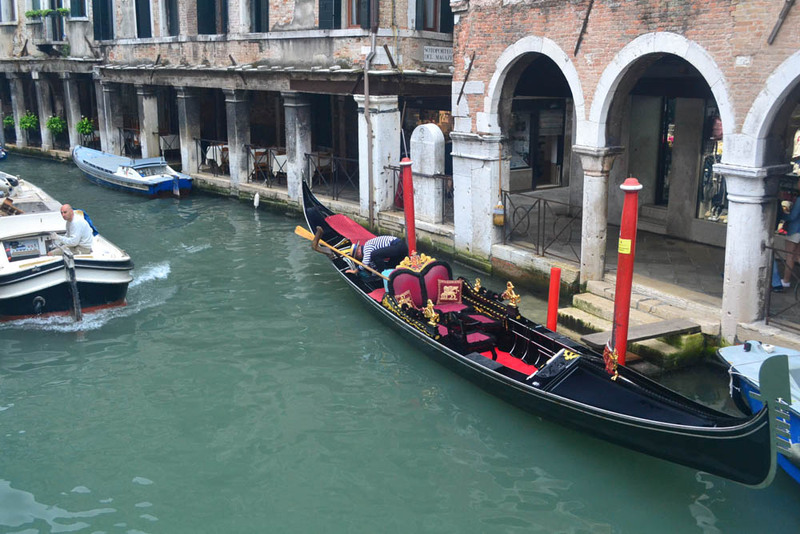 From 80 to 120 euros for around 30 minutes for a gondola, plus an extra tip if you need the gondolier to sing for you, go with a trusted gondolier and a decent idea of the route you want them to take. If there is an official color for Venice, it has to be gold. There are numerous shops and stalls open, selling Venetian marks in red, blue, white, pink but tinged liberally with fake gold dust or gold paint. There are also busts, figurines, miniature ships, daggers, mirrors and a dozen other curios on sale. These Venetian masks are a throwback to the times when the rich and the famous landed in Venice, with their faces and identities concealed by masks so that they could break free of the class hierarchies. Rialto, the hub of commercialism in Venice is connected to the religious and governmental hub of San Marco by the Via Mercerie (street). On this route, we pass by gelato licking, window shopping tourists and get stuck in the occasional tourist traffic jam. 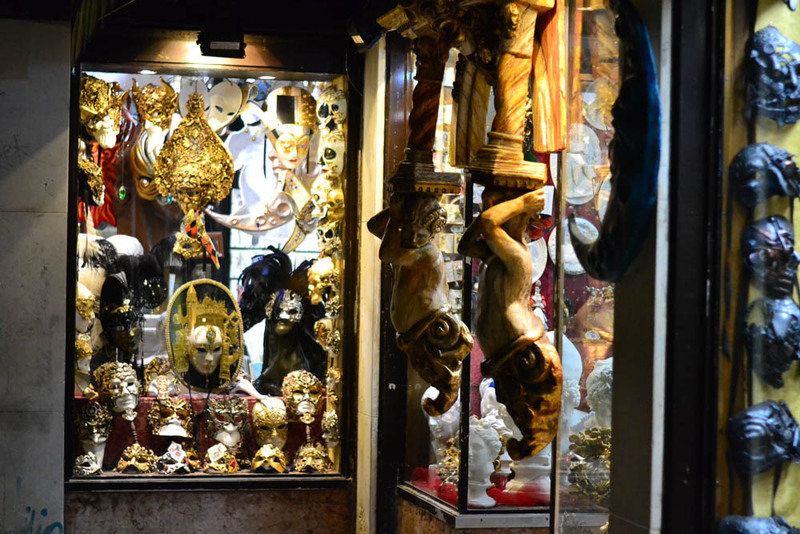 The glass walled shops dotting one of the lanes deal exclusively in hats, or the choicest goods made of the finest Italian leather or showrooms full of Venetian masks, mirrors and other paraphernalia. Fashionably dressed folks walk side by side with drunken, shouting sailors. While we are waiting for people to give way, a woman’s face loses color as her hand goes to her back pocket and she realizes her wallet is no longer there. Venice infamously, also has it’s share of pick pockets. But in spite of the petty crimes, it still is one of the safest cities to roam around, even in the middle of the night. 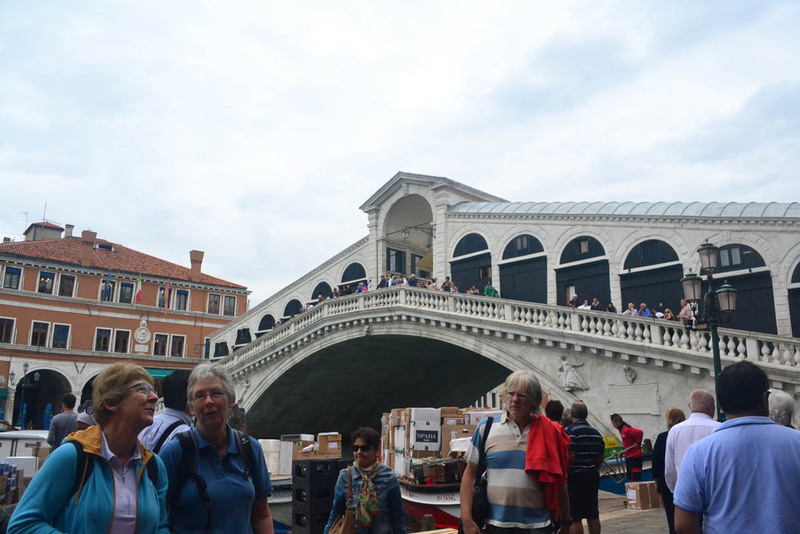 It is not long before we reach the selfie stick-wielding tourists posing in front the famous Rialto bridge. In it’s hey day, Rialto oversaw the trading of pepper, silks from Asia, coffee and rugs from Constantinople and Persia and jute, salt and iron from Europe. During the day, boats dock in and out of the Rialto, loading and unloading boxes filled with imports. We are lucky to find a secluded moment with no activity, but a fine photograph of the Rialto deserves the discipline of an early morning or the patience of a late night. The oldest and most famous bridge in Venice, the Rialto. Built at one point, out of wood, to allow raising the central portion to allow ships to pass, the bridge has collapsed and been rebuilt multiple times over the centuries. 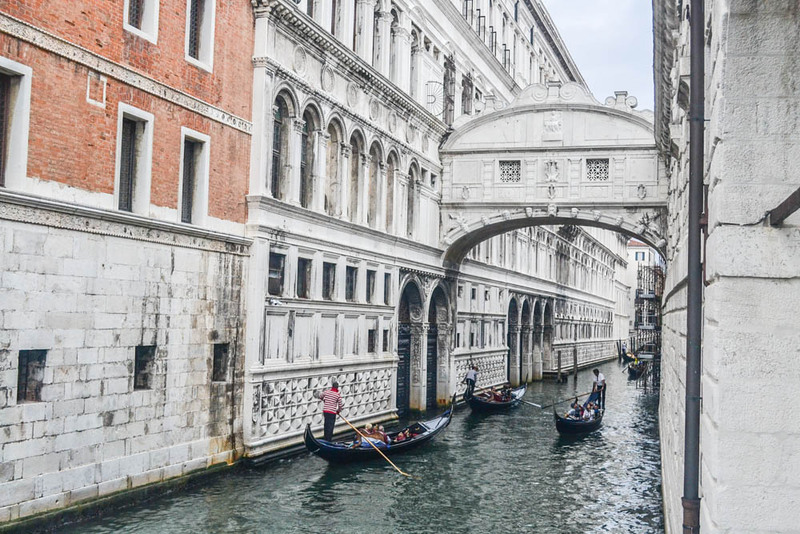 It’s latest and most lasting incarnation is built out of stone and is a replica of the original, with it’s underbridge passage providing some great acoustics for yodeling gondoliers. A famous view from the Rialto, is that of the grand canal, with boats, shops and drifting gondolas sitting cheek by jowl. Early September in Venice also sees the famous Regatta which is a rowing competition between Venice’s rowing clubs. June sees a competition, the Palio of the Maritime republics of Venice, Pisa, Genoa and Amalfi, on these waters of the Grand Canal. The bridge of sighs, apparently named due to the sigh that escaped the lips of the convicted criminals, as they took one last look at Venice through those two little stone grilled windows, before being led to their imprisonment chambers where they awaited execution. We shake off the elbow-to-elbow crowds at the bridge of sighs, the serpentine queues at the Doge’s palace, the Campanile and the Basilica. It is time to catch our train out of here. Venice is too crowded for us, we have to admit, but for the memories, we are content to smile at a replica of a blue and gold Venetian mask, snugly packed in our luggage bag, that will continue to smile back at us for years to come once it finds a place on the walls of our home. amazing place, once in life i want to go there….